Do you want to be a Millionaire? I sure hope so, and don’t for one second ever feel bad about it! Remember money is not all about consumption. It doesn’t mean you have to quit your job or retire altogether; it just means you have the option to do so. It’s freedom! So, if financial freedom sounds like a goal you want to achieve, (and why wouldn’t it be) keep reading to find out the incredibly simple 3-steps to becoming a millionaire. As the adage says, “it takes money to make money.” You may not have the great fortune of becoming a millionaire after your company IPOs. But don’t worry, there is another pathway to reaching the “Two Comma Club,” and saving fuels this journey. Always spend less than you earn. Obviously the earlier and more you can save the better, but even consistently smaller levels of saving can have a big impact in the long run. As usual, Charlie Munger, the outspoken and incredibly wise Vice Chairman of Berkshire Hathaway explains it best, “Spend less than you make; always be saving something… Over time it will amount to something. This is such a no-brainer.” If you only remember one thing from this post, remember this, consistently spending less than you earn is the most important aspect of becoming a millionaire! Once you get the hang of saving, the next step is to figure out what to do with your savings. Take a quick look at the Forbes top 100 list. These individuals didn’t make it to the top just by saving, they invested their savings and continued to grow it overtime. There are several ways to invest. You could; start your own business, buy real estate, or even invest in precious metals like gold. Personally, I like to invest in high quality businesses via the stock market, because I believe over the long run, stocks will generate the highest returns of all investment classes. In addition, investing in stocks has the added benefit of once you own them, they require much less time and attention than running your own business or managing real estate. This makes it much easier to follow step 3. Compounding is a mathematical principle in which something will grow exponentially if left to its own momentum. Step 3 is simple… do nothing! Don’t touch your savings and let the power of compound interest do the heavy lifting. Let’s review a quick case study to show how you can become a millionaire by following these 3 simple steps. Average Joe is 25 years old. He is certainly not a certified financial planner (CFP) and is unaware of the fact that he could use tax deferred/exempt accounts or receive employer matching contributions to help get the most out of his savings for his retirement. He plans on saving $600 per month (roughly $20 per day) until he retires at age 65 (40 years), deposits it into a taxable investment account, and invests in a S&P 500 index fund (a diversified fund of the 500 largest companies in the U.S.). A financial advisor could easily craft a more tax efficient financial plan that would help Joe get more out of his hard earned savings, but his simplistic financial plan provides a very conservative baseline for this case study. In addition to the conservative assumptions used from a financial planning point of view, we also assume Joe’s future retirement date will start at the depths of the 2008-2009 economic recession (March 2009). By setting his retirement date for a market equivalent of March 2009 we are testing our millionaire hypothesis in one of the most terrible of financial market circumstances in the last 120 years. Over these 40 years the total return for the S&P 500 was roughly 7.2% (well below the ~10% historical long term average return for U.S. Stocks). It’s safe to assume that if Joe can become a millionaire under these “worst case” circumstances imaginable than he should be able to reach millionaire status in virtually all other possible scenarios. Average Joe has a net worth $ 1,071,856.33 when he turns 65! Average Joe followed the simple 3 step approach (Save, Invest, and Let Compounding Do the Rest)! Despite a simple financial plan and the dire financial market circumstances upon his retirement date – Joe is a millionaire. 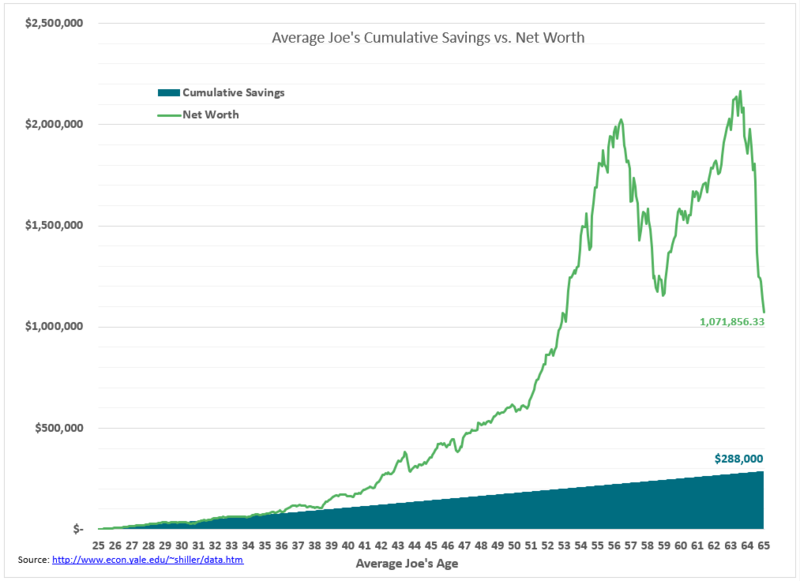 Average Joe took advantage of the power of compounding to grow his $288,000 of cumulative savings by over 372% (nearly 4-fold). Average Joe certainly understands compound interest! By starting when he was young, consistently saving each month, investing in stocks for the long haul, and simply leaving it alone to compound, Joe became a millionaire. Achieving financial freedom doesn’t really get much simpler than that! If you would like to discuss how you can use these simple steps to grow your own wealth, you are welcome to shoot me an email or give me a call anytime.